As a local business owner, your goal is to dominate all three areas on the first page of Google’s search results for the top keywords people use to search for products and services in your niche. You may also notice that the local Google Maps listings usually display anywhere from one to three results (max. ), which means that to get your business listed there, your website must be ranked in the top three among your competitors. That’s where our local directory listing services (also known as local citation services) come in. A local citation is an online directory listing, which, at minimum, includes your business name, address, and phone number, but may also include additional information, such as your website, hours of operation, links to your social media pages, and any relevant photos. In order to rank your website in the top three Google Maps search results for your top keywords, you need to have lots of high-quality online directory listings for your local business. How many? That depends on your competitors—how many citations they have, and the quality of the sites where their business is listed, will determine how many and which ones you will need to outdo them. Our FREE digital strategy auditing service includes a local citation analysis. 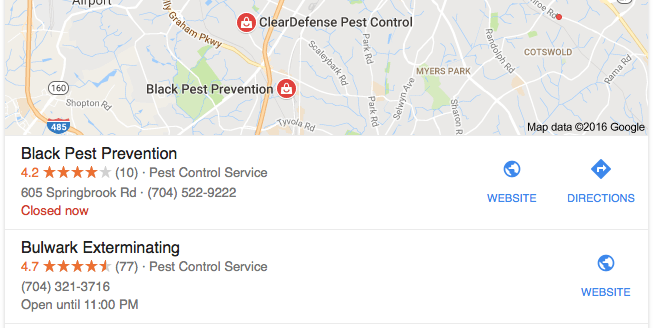 We’ll look at your competition to see how many citations they have and which ones are likely contributing to their Google Maps ranking. You can either submit your NAP to those same directories yourself, or you can hire the pros (ahem … that’s us) to pimp your business for you. Click the button to request a free local citation audit.